"To have friends coming in from afar, how delightful!" Gordon is an acknowledged fancier from Shanghai who has been involved in the sport for over 50 years. When he he smiles he reminds us of a peaceful Buddha. His followers often refer to him as the Shifu (master), a term that the Chinese use to describe someone who fully masters his profession and who is well respected. He paid a visit to PIPA because he he was invited by Jan Hooymans, another grandmaster, who asked him to spend a few days at his loft in Kerkdriel (NL). Gordon seized the opportunity to pass by the PIPA Elite Center as well and with our help he could pay a visit to a number of other lofts in Belgium and The Netherlands as well. During his stay he was accompanied by three close friends (Xue Yuqin, Yuan Naiqing and Zhao Yafeng) and Green Xiang, who is our PIPA agent for Southern China. Gordon had been our guest before in the summer of 2011, when he paid a visit to the Vandenheede brothers in Zingem (B), together with Nikolaas Gyselbrecht and a delegation of the Chinese Embassy in Brussels. 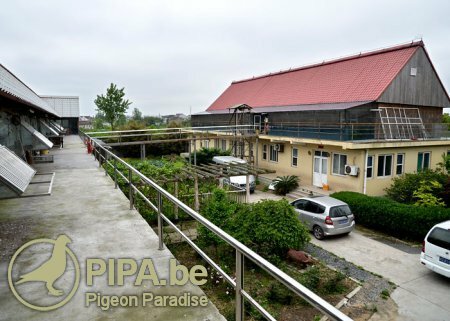 His visit marked the importance of pigeon racing in the international relations between Belgium and China. Many fanciers, both in Belgium and China, considered this to be an important sign of recognition. In his childhood Gordon spent countless hours among the pigeons that his uncle kept on the balcony of his apartment in Shanghai. However, his plans were ruined when the Cultural Revolution broke out in 1966, which was a turbulent time in the history of the Chinese People’s Republic. Mao Zedong, the leader of the Communist Party, led the Cultural Revolution, with the idea of replacing the old, feudal and capitalist values with his own revolutionary culture for the people. Pigeon racing and the betting market was considered offensive; it was part of the capitalist culture and so it was banned. The ban was abolished in the 1970s and the Shanghai Racing Pigeon Association was allowed to continue its activities. Consequently Gordon decided in 1974 to get involved in the sport with unbridled enthusiasm. He successfully joined a few local races only two years later. In 1979 The Shanghai Racing Pigeon Association organised the first Super Long Distance Race. 581 pigeons from three different provinces (Jiangsu, Zhejiang and Anhui) and from the capital Shanghai were released in the city of Yumen (in the province of Gansu) early in the morning on the first day of June. It turned out to be a very demanding race over 2,430 km with only 75 pigeons (13%) reaching their home loft. This mythical “Yumen Super Long Distance Race” is considered a very special event in the history of pigeon racing in China. Gordon’s favourite pigeon managed to arrive home from Yumen and he won a ninth place in the results for Shanghai. Thanks to this result he became increasingly famous in and outside of Shanghai. In 1988 Gordon decided to continue his studies in Canada to obtain an MBA. Before he left for Canada he gave away his entire pigeon collection to a number of fancier friends. Even though this two-year study required a lot of time he never lost his passion for pigeon racing. He read most European and American pigeon magazines from cover to cover and he read reference books to learn more about the development of our sport at international level. When he finished his studies he stayed in Canada to start a professional career. During his stay in Canada he already kept some pigeons at home and he was a member of the Canadian Pigeon Fanciers Association but he did not have the possibilities to take it to a higher level. The nearest club was 150km away from his home and it only had fifteen members. Gordon bred young birds regularly which he sent to his friends in China so that they could be basketed there. Every summer Gordon went on a trip though Europe and the United States to extend his knowledge. He visited the lofts a number of well known fanciers, he attended public auctions and several international races. He met a lot of interesting people and many fanciers liked to invite him to their lofts. Over the years Gordon has gained a lot of knowledge and we are amazed by how much he knows about pigeons and pigeon racing in general. Gordon has been abroad for quite some time but that does not mean he did not follow the development of pigeon racing in his home country. He kept in contact with pigeon fanciers in China and he regularly wrote articles for Chinese magazines, in which he discussed how people experience pigeon racing at international level. Chinese fanciers often consult Gordon about which European pigeons they should buy and they ask him how to take care of pigeons and how to prepare them for the races. He loves to help them and give them advice but he also dreamed about joining a race in China himself one day to achieve great results. Around the turn of the century pigeon racing in China started to develop rapidly and Gordon wanted to return to China more than ever. The company he was working for decided to open a sister company in Shanghai and that would eventually lead to Gordon Chius returning to China. He had a loft built in Nanhui, a district in the southeast of Shanghai and he called his loft Xindalu (The new continent). In autumn he bred a round of 30 youngsters from pigeons he had brought from Canada. However, his preparation for the races in the autumn of 2004 was disturbed by an outbreak of bird flu in China. The district of Nanhui turned into a hotbed of infections. He faced many setbacks just like most other fanciers but he never gave up. He continued to work his way to the top and his efforts paid off eventually. 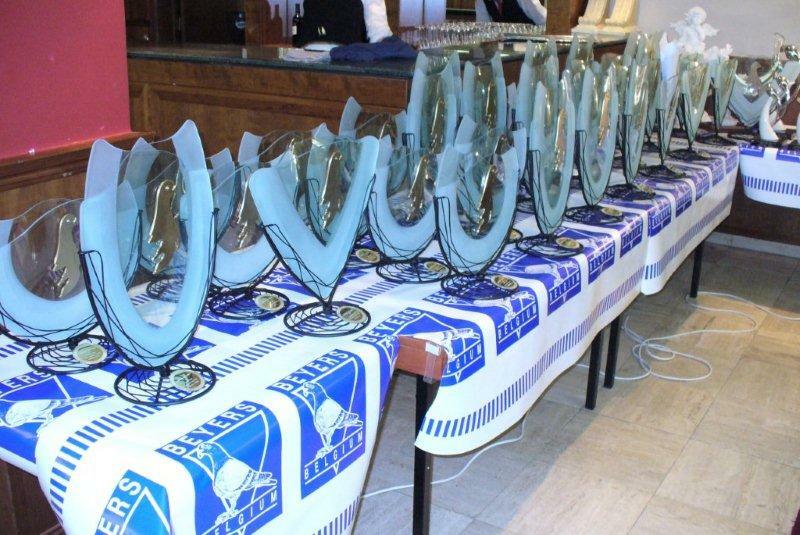 Since his return Gordon has won an impressive number of victories and top prizes, his loft looks like a trophy room. In fact he was so successful that his club in Pudong banned him from their races in 2006. You can find all of his results on his personal website. His breeding pigeons originate mainly from Mike Ganus (USA). 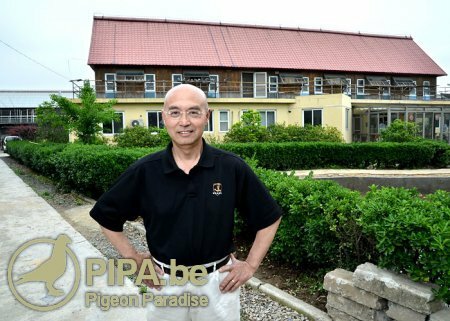 His Xindalu loft houses 150 breeders and 350 racers, which are all descendants of ace pigeons. The One Loft Races are becoming increasingly popular in China but Gordon trusts only pigeons that have been successful in different races in various weather conditions over an extended period of time. You could say that his Xindalu loft is home to ace pigeons. We asked Gordon what races have left a lasting impression on him and he remembered a particular race from Shangqiu in 2005 (Henan province – 700km). 5,851 pigeons were liberated that day at 05:40 in the morning. Gordon clocked two pigeons at 17:18; the first pigeon has been clocked in Jiading about fifteen minutes earlier. However, the district in Shanghai was 60km closer to the release site than Gordon’s loft. When his two pigeons landed simultaneously he was convinced that they had been flying a lot faster than the other birds in the race. He was right. He took the first and second prize, as well as the seventh and ninth. Gordon decided to pair his two winners and he achieved great results with the descendants of this Shangqui pair. On his website you can find testimonies from fanciers from across China who have been performing very well thanks to the pigeons Gordon had bred. Gordon sometimes purchases pigeons via PIPA’s auction platform as well. In November 2010 he purchased, for instance, Son Gilbert, which was offered by Erik Limbourg in the fifth part of PIPA’s Jewels of the Sky auction. A youngster that was bred from this Son Gilbert achieved a first prize in a prestigious race in Shanghai that is organised annually. This victory was the ultimate proof for Gordon that PIPA’s quality control is really invaluable; it shows that PIPA wants to offer nothing but the very best pigeons available. “It was a very enjoyable trip. On behalf of all our team members, I would like to express our sincere appreciation to PIPA.